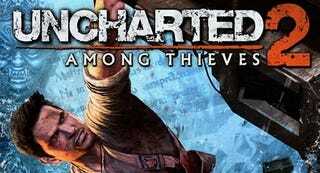 Uncharted 2: Among Thieves is the highest rated game of the year, winner of more than a few publications' Games of the Year awards. But that doesn't mean it did everything right. Noah Wardrip-Fruin, assistant professor at UC Santa Cruz and author of Expressive Processing: Digital Fictions, Computer Games, and Software Studies, pokes some holes in the game's seeming perfection. The design of Uncharted 2: Among Thieves should make integrating gameplay and fiction easier in two particular ways. First, it's linear, so there's no need to worry about unexpected traversals of the fictional space. Second, it's almost entirely scripted - a matter of how adeptly things are accomplished, rather than what approach is taken or what tasks are attempted - so there's little chance of unexpected emergence from game mechanics coming into play in places, times, or combinations other than what the developer intended. Given these advantages/limitations, the game's creators shouldn't have much trouble making sure that gameplay action is solidly motivated by, situated in, and consistent with the fictional world. And it appears to have worked, at least from the game's reception. As you probably know, the game has been getting great reviews that call it "a rollicking good yarn" that "gives up nothing to the biggest action films you can think of." I've just started playing myself - thanks to winter break - but I'm actually a bit disappointed in Uncharted 2. It seems as though the gameplay and fiction have more disjuncture than even in the first Uncharted, much less a well-written movie. Consider, for example, the first major chunk of action (after the prologue in the snow). This is set in a museum, and Nathan Drake (the main character) takes pains to explain to his accomplices that he doesn't want them to bring guns, because they're just going up against museum guards - and he doesn't want to kill anyone. This leads to a bunch of non-lethal hand-to-hand. Next it is revealed that one of the accomplices has brought guns. But they're non-lethal dart guns, so it's okay, and a bunch of museum guards get tranqed. Then, in the midst of this, Drake is hanging from a roof edge when a guard walks toward it. The game prompts the player to hit the square button - which results in grabbing the guard and throwing him to his apparent death. An accomplice makes a joke of this and Drake makes no mention of this completely out of character action. Others have also found this strange. But the associated joke (the one that starts, "There's a guy above you!") also appears to be one of the game's most-quoted. The next big chunk of action has an even-odder break between the fiction and the design of the gameplay. Here the scenario involves a set of explosive charges that have been placed around a camp. The player character must arm them so that they can be used as part of a diversion. But the process of arming them requires fighting a camp of men armed with automatic weapons - an accomplice says we'll have to "clear the place out" - and the game neither prompts nor seems to provide the possibility of doing this via stealth. So the only way to play is to have a large firefight against people armed with automatic weapons and presumably aware of the route back to the main camp to warn their fellows. This seems likely to create at least as large a "diversion" (at the wrong fictional moment) as blowing up a few explosives mounted to the sides of the very platforms around which the firefight takes place. It's as though the fiction authors said "Let's have them arm some charges" and the gameplay authors said "Let's have the associated challenge be a firefight with several waves of goons" and no one checked to see if the gameplay made any sense with the context and motivation of the fiction. Starting the game this way was leaving me a bit dispirited, though wanting to press on, given the Edge review's reassurance that the "opening chapters do not see the game at its very best." But then I heard the questions I was asking myself. "Did they put that guard's death in there just so they could work in that joke?" "Why didn't even a single one of the many goons we fought think to run the short distance to the main camp, if they were cut off from their radios?" I realized - these are exactly the sorts of questions I find myself asking after seeing the same blockbuster action movies on which the Uncharted games model their experience. Arguably this is a sign that the Naughty Dog developers are right on target. It wouldn't have occurred to me as a goal, but it might be a sign of perfection to have emulated not only the globe-hopping spectacle and history-mashing treasure hunts of well-loved action films, but also their sloppiness in integrating action and fiction. Let's hope, however, that Uncharted 3 can reconsider this aspect of devotion to its inspirations. Reprinted with permission from expressiveintelligentstudio.